Overview - The story of the marriage of England's King Arthur to Guinevere is played out amid the pagentry of Camelot. The plot of illegitimate Modred to gain the throne and Guinevere's growing attachment to Sir Lancelot, whom she at first abhors, threaten to topple Arthur and destroy his "round table" of knights who would use their might for right. "On second thought, let's not go to Camelot. It is a silly place." Before watching Joshua Logan's 'Camelot,' I never realized just how accurate that quote was. It is a silly place. A very silly place indeed. But, thankfully, it's also not without its charms. A lavish musical inspired by the Arthurian legend, the film features a strong cast, some impressive sets and costumes, and a wonderful soundtrack full of catchy melodies and witty lyrics. It's also deliciously cheesy at times, with a couple of dated sequences and stylistic choices that are likely to elicit more than a few unintentional laughs. Still, the movie is certainly entertaining, and the narrative does have its fair share of effective drama throughout its three hour running time. On second thought, it might actually be worth a trip after all. 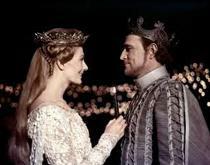 Based on the 1960s musical production from Lerner and Loewe, the film tells the tale of King Arthur (Richard Harris) and his beloved Guenevere (Vanessa Redgrave) as they marry and rule over the kingdom of Camelot. A fair and just leader, Arthur spreads his concept of "might for right" around the land, leading to the creation of the legendary round table. Just as things are looking great for the two lovebirds, their happy life together is suddenly complicated when a dashing French knight, Lancelot (Franco Nero), enters the picture. Though initially turned off by the handsome hero's excessive bravado, Guenevere eventually develops deep feelings for him. As the love triangle evolves, a new threat emerges, signaling potential tragedy for our trio and the entire kingdom -- all set to plenty of rousing musical numbers, of course. The music itself is quite lovely. The melodies are catchy and the lyrics bring some welcomed wit and clever wordplay to the proceedings, giving form to the characters' anxieties, desires, and machinations through the joyous gift of song. Logan's staging of the performances is also pretty decent, lending a solid cinematic quality to the picture. Though mostly basic, the director's style is not without a few imaginative flourishes. Logan will frequently employ spatial cuts during individual musical numbers, which suddenly transition characters to different locations within the same song. One moment Lancelot may be belting out a note while riding a horse, and then the next he is suddenly on a boat, and the next atop a castle (not unlike an infamous Old Spice commercial). This adds a fun sense of diversity to the staging and helps to open up the scope. The trio of main stars all turn in great performances. As King Arthur, Richard Harris engenders an inspiring sense of honor and compassion. Though the actor can ham it up a bit on screen, the character still exudes strength, nobility, and a commendable sense of justice -- sort of like a singing, dancing Eddard Stark. Vanessa Redgrave is beautiful and heartbreaking in the role of Guenevere. The actress does a great job of balancing the Queen's divided affections, and really sells her conflicted emotions. Though his initial Gaston-like introduction makes him out to be rather pompous, Franco Nero reveals a gentler side to Lancelot, elevating the character beyond a mere foil to our hero. All three actors do the legendary romance justice, adding layers of grey to their tragic relationship. Despite the movie's strengths, it's not without some problems. The entire production has a very old fashioned, theatrical tone, and while that's not necessarily a bad thing, some elements of the story can come across as overly dramatic and quite silly. There are definitely moments of intentional comedy, but certain directorial choices and blocking decisions are downright cheesy (a "love" montage between Lancelot and Guenevere has not exactly aged well). Any scene involving Merlyn (Laurence Naismith) and his bizarrely glazed over eyes is also sure to elicit some seemingly unintentional laughter. One scene, in which a child version of Arthur appears alongside Harris, is particularly funny, as both actors awkwardly try to speak and move about in unison, forcing unnatural, simultaneous gestures. Of course, these humorous, dated qualities are understandable, and to be honest, they're quite entertaining to watch. Less entertaining, however, is the sometimes trying pace of the film. At three hours, the movie does indeed drag in spots, particularly during stretches where musical numbers are sparse and traditional drama takes over. In addition, the story's true antagonist, Arthur's illegitimate son Mordred (David Hemmings), is severely underdeveloped, leaving little on screen motivation for his nefarious actions. Though a little cheesy and melodramatic, 'Camelot' is an entertaining, old fashioned Hollywood musical full of beautiful melodies and wonderful production design. Despite its sometimes silly qualities, at its core this is actually a rather somber and tragic story, and the cast does a nice job of handling the emotional material. The movie's ultimate themes are timeless and inspiring, even if one is compelled to chuckle at inappropriate times. It's not exactly a classic, but the film is certainly worth a look, especially for fans of similar efforts from Lerner and Lowe ('My Fair Lady,' and 'Paint Your Wagon'). 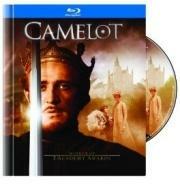 Warner Bros. brings 'Camelot' to Blu-ray on a BD-50 disc housed in an attractive digibook case. After some warnings and logos, the disc transitions to a standard menu. The digibook package offers 37-pages filled with production history, trivia, details on the cast and music, and several great photos. An additional audio CD is also included with four sample tracks from the film's soundtrack: "I Wonder What the King is Doing Tonight," "Camelot and the Wedding Ceremony," "How to Handle a Woman," and "If Ever I Would Leave You - Love Montage." The movie is provided with a 1080p/AVC MPEG-4 transfer in the 2.40:1 aspect ratio. While there are some minor inconsistencies, overall this is a very nice and at times even striking transfer. The source is in great shape, with only a few fleeting specks here and there. A light layer of grain is visible throughout, adding some rich texture to the image. The first few scenes in the film are quite soft, hazy and drab, but thankfully, once the characters actually reach Camelot, the picture takes on a new life. Detail and depth are often great, revealing all of the tiny details in the lavish costumes and sets. Individual links of chainmail armor and intricate textures on Vanessa Redgraves's dresses are all resolved in sharp clarity. The knights' shining armor and Arthur's glittering tights (yes, you read that right) pop from the screen. A jousting tournament and a wedding ceremony lit by hundreds of candles are particularly impressive. Colors often veer toward an earthy palette that favors golden hued browns, but there is some solid vibrancy. Contrast is well balanced with steady (albeit slightly elevated) black levels. With all that said, there are a few minor irregularities. A few quick shots look noticeably grainier than the rest of the picture, and the hazy softness of the opening scenes does return periodically. Still, these issues all seem to be inherent to the source and original photography. Fueled by sometimes gorgeous widescreen cinematography, 'Camelot' comes to Blu-ray with a mostly impressive transfer. A few sequences can look a bit fuzzy and drab, but the majority of the presentation is quite beautiful and seemingly faithful. The audio is presented in an English DTS-HD MA 5.1 track with optional English SDH, French and Spanish subtitles. Despite a few technical hiccups, the film's pretty melodies come through beautifully. Dialogue and vocals are usually clean, with a nice, full quality. With that said, there is a faint hint of peeking during some of the songs (particularly with Vanessa Redgraves' vocals). The score and musical numbers all feature solid separation across the soundstage, with individual cues, instruments, and backup vocals spread naturally across the front and even surround speakers. Some very minimal ambiance (rusting wind, chirping birds) also reaches the rears. Imaging can sound a little forced at times, however, with a few audio pans coming across as slightly unnatural. Dynamic range is good but not as wide as modern releases. Bass activity is sparse, but a more aggressive low frequency presence would have likely felt out of place. While pops and hissing are negligible, I did detect some brief instances of crackle during the climactic "Guenevere" number near the end of the film. The songs and score are all wonderful (I'll be humming the title track for weeks) and the 5.1 mix does a decent, though not exceptional job of utilizing the full soundstage. There are some minor technical anomalies, but the mix mostly succeeds. Warner Brothers has provided a nice assortment of special features including a commentary and some behind-the-scenes featurettes. All of the extras are presented with the same subtitle options as the main film. Commentary with Stephen Farber - Film critic Stephen Farber offers a decent discussion of the movie. Farber provides a basic assortment of production details and trivia, covering casting, locations, shooting challenges, and differences from the source musical. Farber also shares some gentle criticism of the film's pace and direction, and addresses the picture's place within the declining allure of Hollywood musicals. Some time is also spent addressing President Kennedy's reported fondness for the theatrical show. There are frequent pauses in the commentary (usually during the songs), but big fans might want to take a listen. The Story of Camelot (SD, 10 min) - This is a brief vintage featurette that offers some decent behind-the-scenes footage detailing the movie's costumes and sets. The World Premiere of Camelot (SD, 29 min) - Another vintage promo piece is included, this time focusing on the film's premiere in Times Square. Two hosts interview several of the cast and crew as they arrive (including Richard Harris in full-on Arthur garb). Some behind-the-scenes clips are also interspersed throughout. Though there are some decent insights buried beneath the vintage studio fluff, the best part of the featurette is actually a wonderfully retro advertisement for a 'Camelot' inspired line of gowns. Trailers (SD) - Five standard definition theatrical trailers for the film are presented. 'Camelot' is a bit silly at times, and there are some pacing concerns, but its catchy music remains captivating and the talented cast turns in some good performances. Though Joshua Logan's direction is slightly awkward in spots, the magnificent sets and costumes lend the production a certain magical charm. Video quality is a little uneven, but can be quite striking, and while the audio mix suffers from a few very minor technical hiccups, the songs all come through wonderfully. The included supplements offer a fairly comprehensive look at the film's production. All in all, this is a well produced 45th anniversary disc that is definitely worth a look.